Art and science, anxiety and nostalgia. 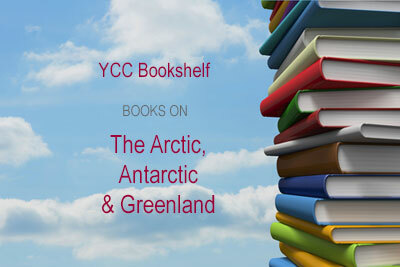 They all come together in books providing polar views of the polar regions. The descriptions of the books are drawn from copy provided by the publishers. When two dates of publication are included, the second marks the release of the paperback edition of the original hardcover. Barry Lopez’s National Book Award-winning classic study of the Far North is widely considered his masterpiece. Lopez offers a thorough examination of this obscure world – its terrain, its wildlife, its history of Eskimo natives and intrepid explorers who have arrived on their icy shores. But what turns this marvelous work of natural history into a breathtaking study of profound originality is his unique meditation on how the landscape can shape our imagination, desires, and dreams. Its prose as hauntingly pure as the land it describes, Arctic Dreams is nothing less than an indelible classic of modern literature. This book was written out of Gretel Ehrlich’s love for winter and also out of the fear that our “democracy of gratification” has irreparably altered the climate. Over the course of a year, Ehrlich experiences firsthand the myriad expressions of cold. From Tierra del Fuego in the south to Spitsbergen, east of Greenland, at the very top of the world, she explores how our very consciousness is animated and enlivened by the archaic rhythms and erupting oscillations of weather. We share Ehrlich’s experience of the thrills of cold, but also her questions: What will happen to us if we are “deseasoned”? If winter ends, will we survive? See also her 2003 book This Cold Heaven: Seven Seasons in Greenland. Out of our fascination with Antarctica have come many books, most of which focus on only one aspect of its unique strangeness. None has managed to capture the whole story – until now. Drawing on her broad travels across the continent, Gabrielle Walker weaves all the significant threads of life on the vast ice sheet into an intricate tapestry, illuminating what it really feels like to be there and why it draws so many different kinds of people. With her we witness cutting-edge science experiments, visit the South Pole, drive snowdozers, drill ice cores, and listen for the message Antarctica is sending us about our future in an age of global warming. This is a thrilling trip to the farthest reaches of earth by one of today’s best science writers. Ninety percent of Greenland is covered by ice; its ice sheet stretches almost 1,000 miles from north to south and 600 miles from east to west. But this stark view of ice and snow is changing rapidly. Greenland’s ice sheet is melting; the dazzling, photogenic display of icebergs breaking off Greenland’s rapidly melting glaciers has become a tourist attraction. The Fate of Greenland documents Greenland’s warming with dramatic color photographs and investigates its climate history for clues about what happens when climate change is abrupt rather than gradual. Abrupt climate change would be cataclysmic: the melting of Greenland’s ice shelf would cause sea levels to rise twenty-four feet worldwide. Clearly, it is in all of our interests to pay attention. In Future Arctic, journalist and explorer Edward Struzik offers a clear-eyed look at the rapidly shifting dynamics in the Arctic region, a harbinger of changes that will reverberate throughout our entire world. … A unique combination of extensive on-the-ground research, compelling storytelling, and policy analysis, Future Arctic offers a new look at the changes occurring in this remote, mysterious region and their far-reaching effects. Icebergs are increasingly seen to play key roles in past and present climate change. This book gives a comprehensive, multidisciplinary view of icebergs and their interaction with the Earth system, from the physical and biological interaction with the ocean and climate, to how iceberg detritus informs us about past Earth history. Societal and cultural aspects of icebergs are also examined, in terms of the risks and opportunities posed by icebergs in the modern world, as well as how these might develop in the future. With extensive illustrations and key links to online resources, Icebergs is a valuable reference for academic researchers and graduate students studying oceanography, cryospheric science, climatology and environmental science. Peter Wadhams has been studying ice first-hand since 1970, completing 50 trips to the world’s poles over nearly five decades. His conclusions are stark: the ice caps are melting. There is now the probability that within a few years the North Pole will be ice-free for the first time in 10,000 years. An ice-free arctic summer will, he argues, have an albedo effect nearly equivalent to that of the last thirty years of warming. A sobering but urgent and engaging book, A Farewell to Ice shows us ice’s role on our planet, its history, and the true dimensions of the current global crisis, offering readers concrete advice about what they can do, and what must be done. Over numerous seasons, William E. Glassley and two fellow geologists traveled to Greenland to gather evidence to prove a contested theory that plate tectonics, the movement of Earth’s crust over its molten core, is a much more ancient process than some believed. 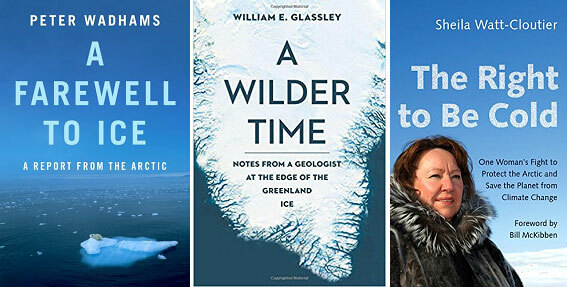 As their research drove the scientists ever farther into regions barely explored by humans for millennia – if ever – Glassley encountered wondrous creatures and natural phenomena that gave him unexpected insight into the origins of myth, the virtues and boundaries of science, and the importance of seeking the wilderness within. An invitation to experience a breathtaking place and the fascinating science behind its creation, A Wilder Time is nature writing at its best. The Right to Be Cold is the human story of life on the front lines of climate change, told by a woman who rose from humble beginnings to become one of the most influential Indigenous environmental, cultural, and human rights advocates in the world. Raised by a single mother and grandmother in the small community of Kuujjuaq, Quebec, Watt-Cloutier describes life in the traditional ice-based hunting culture of an Inuit community and reveals how Indigenous life, human rights, and the threat of climate change are inextricably linked. The Right to Be Cold is at once the intimate coming-of-age story of a remarkable woman, a deeply informed look at the life and culture of an Indigenous community still reeling from a colonial history, and a stirring account of an activist’s powerful efforts to safeguard Inuit culture, the Arctic, and the planet. The Extreme Ice Survey is the most extensive visual study ever conducted to illustrate the catastrophic melting of glacial ice. The result is a dramatic and timely demonstration of global warming’s dangerous consequences from Alaska to Iceland to the Alps. Serviced via foot, horseback, dogsled, skis, fishing boats, and helicopters at 15 sites in the Northern Hemisphere and programmed to shoot once an hour, every hour of daylight, each of the 26 cameras captures approximately 4,000 images per year. This stunning collection of photographs was part of an outreach campaign aimed at educating the public about global warming and providing irrefutable scientific evidence of how rapidly our planet’s climate is changing. Since 2005, renowned nature photographer James Balog has devoted himself to capturing glaciers and documenting their daily changes. His images celebrate some of the most extra-ordinary natural formations on earth, as well as demonstrate the stark consequences of global warming – from Alaska to Iceland to the Alps. As glaciologists for the Extreme Ice Survey, Balog and his team are conducting the most extensive glacier study ever, covering France, Switzerland, Iceland, Greenland, the United States (Alaska and Montana), Nepal, Bolivia, and Antarctica. Their high-resolution cameras capture approximately 4,000 images per year. This collection presents the most stunning panoramic photography of glaciers ever published. Master photographer and Global Green leader Sebastian Copeland issues a global clarion call in his latest book, the sequel to his bestselling Antarctica: The Global Warning. Copeland’s awe-inspiring images of the frozen continent capture the beauty of the glaciers, biodiversity, and wild wide seas of the Drake. Along with exceptional new photographs, Antarctica: A Call to Action is a concise and visually compelling discussion about global warming with a hopeful and helpful new take: each of us can make a positive difference through small changes. A highly accessible and hopeful book, Antarctica: A Call to Action will inspire everyone to save this magnificent continent for future generations. Few landscapes convey Nature in all of its untamed splendor like the Arctic. Fewer still conjure respect like the seldom traveled and ethereal North Pole. Yet, sadly, this largely pristine and mostly misconceived treasure is now in jeopardy. Sebastian Copeland’s noble goal in these pages is to pay homage to this wonderland, and, in turn, to draw awareness to its perilous plight. A polar explorer, an award-winning photographer, and a dedicated environmental activist, Copeland offers us a unique vantage point from which to appreciate the Arctic. Although the vision presented in these pages may be poetic, the book’s aims are pragmatic -to seduce and inspire the world in order to help foster a market transformation towards a sustainable future. Much has been written about global warming, but the crucial relationship between people and ice has received little focus. With clarity and insight, geophysicist and a co-winner of the 2007 Nobel Peace Prize, Henry Pollack, paints a compelling portrait of the delicate geological balance between Earth and its ice, and shows why the current rapid loss of ice portends serious consequences in our not-so-distant future, including rising sea levels and subsequent flooding of low-lying regions worldwide. Pollack traces the effect of mountain glaciers on supplies of drinking water and agricultural irrigation, and the current results of melting permafrost and shrinking Arctic sea ice. A World Without Ice explains why ice matters and lay outs out the urgent actions we can take to restore Earth’s delicate climate balance.